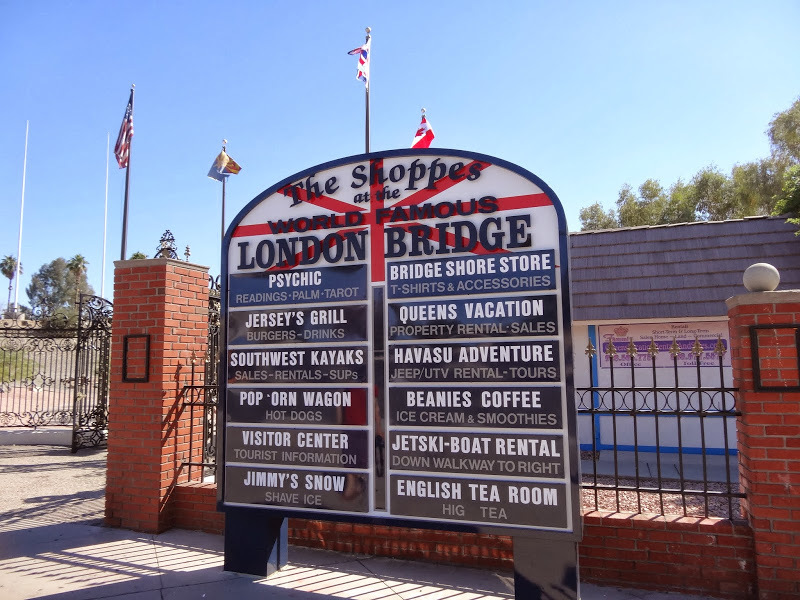 I can’t even remember when did I hear for the first time the story about the sale and reconstruction of the old London Bridge in the deserts of Arizona. I guess it must have been ages ago, probably soon after I moved to London. Let’s face it, it is one of those fascinating stories which locals love to tell to tourists and newcomers to the city over a pint or two. So, I was aware that there is a London landmark relocated stateside but that was it, I never really thought much about it. But then, last year, I came across an interesting book about the whole thing. It is called: “London Bridge in America: The Tall Story of a Transatlantic Crossing” by Travis Elborough. Now, the book is a bit hipsterish, but it is also is a fascinating mix of social and architectural history. As I’m mildly obsessed with bridges and civil engineering there was no need to tell me twice about it, and I read it in two days (well, maybe three). But even if you don’t share my weird passion I strongly recommend this book as it is simply fun to read. Then during the planning of our latest American road trip my girlfriend and I realised that we would be passing not far from the current location of London Bridge. As we both share a passion for architecture, history and whacky trivia we just had to go there. And that’s how we ended up driving across the empty Arizona deserts towards Lake Havasu City about 60 miles south of Kingman. Even though the road crosses scenic but absolutely desolate landscape, we kept passing plenty of trucks hauling boats and other sort of water craft. The reason for all this craft becomes visible a few miles before reaching the city. 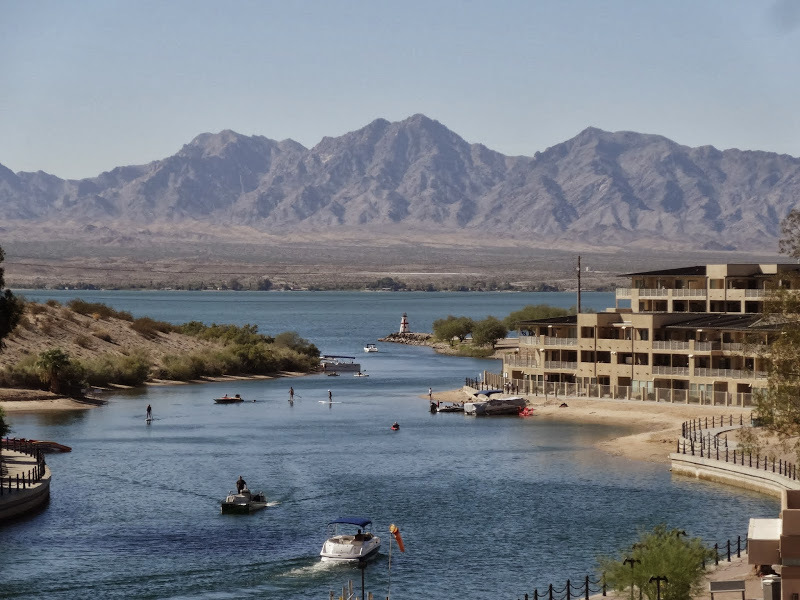 It is Lake Havasu which was created by damming the Colorado River in 1938. Like many other reservoirs in this part of America it has a stunning location with its deeply blue waters contrasting strikingly with the reds, yellow and browns of the surrounding desert. For years there wasn’t much activity on the banks of the lake and it was used mostly as a water storage facility for irrigation purposes. Then, in the 1960s, one Robert P. McCulloch bought land on its shore and decided to built a town from scratch. It seems that he was an eccentric fellow and looking for some feature for his new town he came across the old London Bridge which was then marketed for sale by the City of London Corporation. 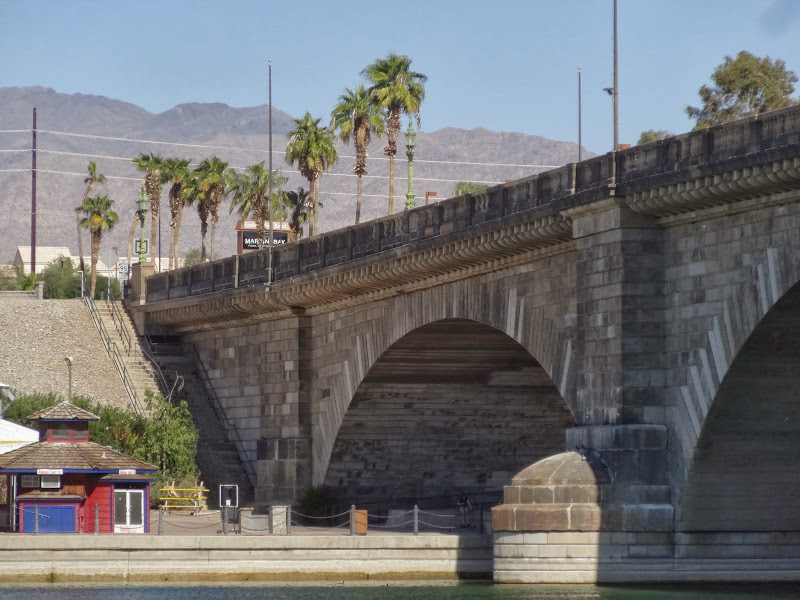 He won the auction and the bridge was dismantled piece by piece, shipped via the Panama Canal and then reassembled on a dusty peninsula on the Lake Havasu. Once completed, the Bridgewater Channel Canal was dredged under the bridge and flooded, separating Pittsburgh Point from the city, creating an island. The bridge opened in 1971 becoming the main marketing icon for the new development. Now, there is an urban legend (popular especially among those sophisticated Brits who are a bit snobbish towards the Americans) that McCulloch though he was buying Tower Bridge instead. But that’s it. It is just a legend. 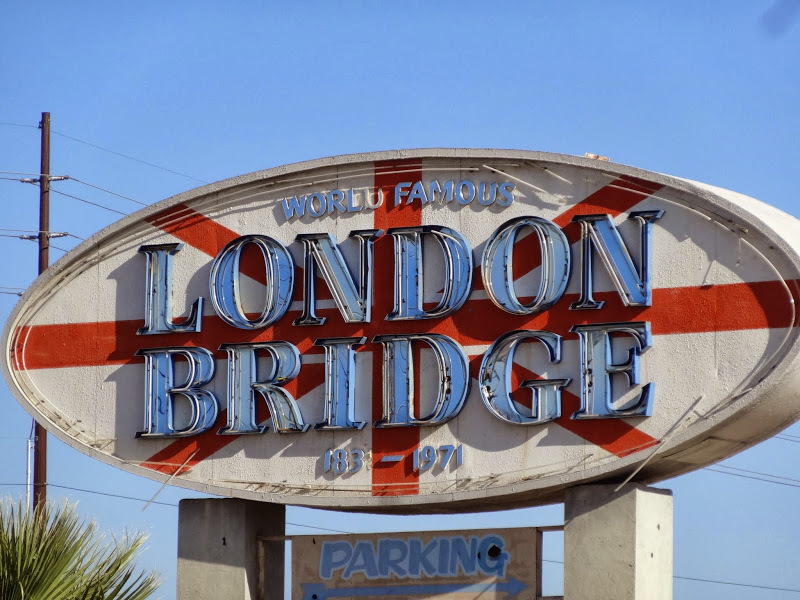 The bridge was always extensively and precisely marketed as London Bridge, with architectural drawings, specifications and even images. So, as much as some would like to believe in it, there wasn’t any con sale to silly American by some clever cockney lad. So, how does it all looks now? Well, strange. For one thing the bridge is easy to miss when driving the main road into town, the Arizona Hwy 95. It is one of these featureless suburban highways lined by endless strip malls, big box stores and drive-through businesses. It goes on for miles and miles and it feels quintessentially American. We almost missed the turn, only spotting the bridge on the right at the last moment. 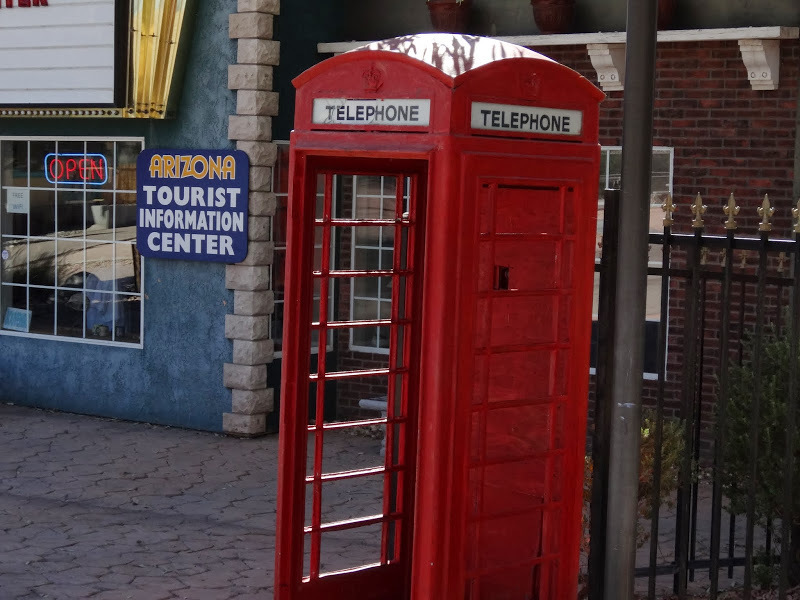 Walking from the parking lot to the bridge we had to pass through a really kitschy looking plaza with some London City dragons, a lions-encircled fountain and even a lonely red telephone box which looked particularly out of place with the Arizona Tourist Information Center right behind it. The bridge itself looks rather splendid with palm lined approaches, azure waters below it and clear blue sky above it. Honestly, writing these words on a windy, rainy, grey and generally miserable day in London, I think the bridge ended up much better off than I did. Anyway, we had a stroll across the bridge and under it enjoying the beautiful day but after 10-15 minutes and taking few dozens pictures, there was nothing else to do there. We found Lake Havasu City one of those strange, completely unremarkable, non-places. If not for the bridge it could be a suburb of Houston, or Dallas or Phoenix or LA. If, unlike us, you are not following strange landmarks there is not much to see there. The main draw for most people here is simply the lake itself. People fish, boat, water ski or simply hit a beach. There is even an aptly named London Bridge Beach which, let me assure you, is way more scenic than the bit of mud you can enjoy in London at a low tide. Here I have to admit that I’m not a big fan of water, in fact I can’t even swim. So we didn’t linger in town but hit the road again and headed towards Las Vegas, which is much more my cup of tea. Still, overall it was a strangely fascinating place which, regardless of its lack of focus (apart from London Bridge), I found interesting. But then, I do have strange interests. For example I found out that one of the London City churches, St. Mary Aldermanbury, was relocated to Fulton, Missouri. 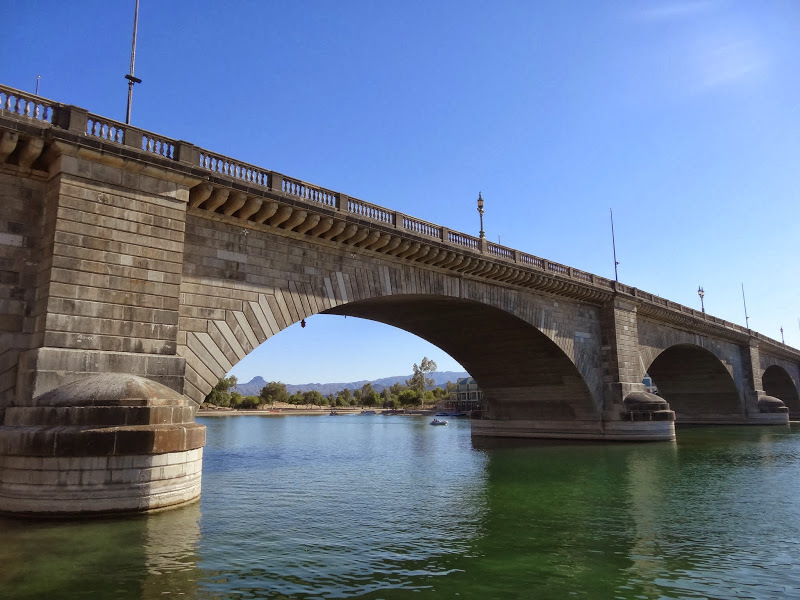 This entry was posted in Uncategorized and tagged Arizona, Lake Havasu, Lake Havasu City, London Bridge, Robert P. McCulloch on March 23, 2014 by admin.